Plex is a centralized home media playback system with a powerful central server (Plex Media Server) that streams its media to many Plex player Apps which can reside on a number of devices from Roku, Amazon Fire TV, HTPC’s, mobile devices and even Smart TV’s. The Server is available on many platforms like Windows, OS X, and many flavors of Linux, as well as many NAS devices. The Chowmain Plex Full driver is one of the only Control4 drivers to have full library integration including Movies, TV Shows, Music and photo browsing/searching/playback and can be used to control Plex on various platforms including Roku, Amazon Fire TV, Sony Android TV’s (FY15 up), Dedicated HTPC’s running Plex Home Theater or Plex Media Player. This complete solution provides the consumer will seamless playback of content from any Control4 interface including SR-250/SR-260, Onscreen Navigator, Touchscreens, IPhone/Android based Navigators and more. This driver will only work on Control4 OS 2.7 and above. Ability to browse/search/playback Movies, TV Episodes, Music & Photos from any Plex client/server with cover art including local or remote servers. Ability to browse content by recently added, recently aired, recently viewed and more. Ability to resume movies or tv episodes from where you have left off. Ability to program any event in Control4 to trigger playback. Eg keypad on the wall, security system disarm, motion sensor trigger. Ability to automatically turn the room on upon playback. This is good for dedicated Plex systems where you might want to send playback of content from your mobile device or tablet to your TV. Can be setup for any Plex Client including Plex Home Theater, Plex Media Player, Plex for Roku, Plex for Amazon Fire TV and Plex for /Android TV's. Ability to launch Plex on Roku and Amazon Fire TV devices. Upon media playback the driver will launch Plex on the device, wait for it to startup and then start playback. Support for Sky Now TV and Telstra TV boxes (Roku rebadged boxes). Ability to return to the Roku, Amazon Fire TV or Sony TV drivers upon exiting Plex. Makes the experience seamless. Ability to return to onscreen navigator on playback ended. This is great if you want to hide Plex’s interface and use Control4 only. Ability to switch users. This allows for content restriction based upon username/passcode. Limit children to G rated content only. 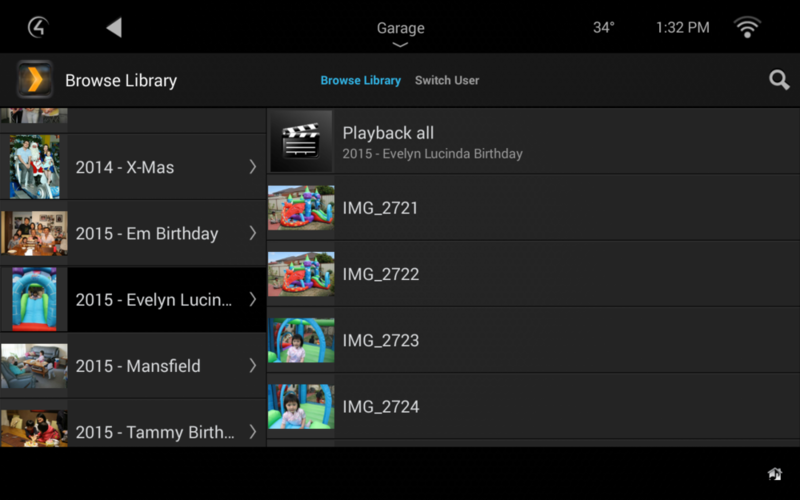 This also allows multiple family members to resume playback from different spots. I'm confused which Plex driver should i be using? A while ago we created the Plex Home Theater driver and Plex Media Player driver. These drivers utilised the older Control4 media player interface which could only handle movie integration. Back in August 2015 we released Kodi Full. This driver utilised a new method to display content on Control4’s devices. We decided that we would improve on our Plex driver’s by doing something similar and have named it to match our Kodi Full driver. Plex Home Theater is still an excellent driver and may do everything that you want. Plex Full however is superior to Plex Home Theater and the development time period reflects that. Do i need to the Plex Media Server driver as well? No additional drivers are required to operate Plex Full. Please read the installation PDF to get an understanding on how the driver works and how to set it up. Browse/search/playback movies, tv shows, music, photos from Plex.on any Control4 user interface including touchscreens, onscreens, smart phones, tablets and remote controls. Resume content that you have started watching from where you left off. Complete your media playing solution by pairing our driver with a Roku or an Amazon Fire TV. Both devices can utilise streaming services such as Netflix or Hulu. With our driver installed the customer will now be able to browse/search/playback any of his own personal content on the system. This driver provides two way feedback on what media you're consuming and what the state of the media player is. It will tell you when the movie is playing, paused, stopped or if it is a video, photo, song or if it is in navigation. This information is useful for customising your lighting and environment to suit your customer's requirements. Start a movie on your tablet and then cast it to your theater to have your theater automatically turn on. Fall asleep at the TV? The driver will automatically turn the room off once the movie has finished after a period of time. Setup a button on your onwall keypad to start playback of you or your family’s favourite movie. One touch playback. Great for kids. Limit the content your children can watch to G or PG-13 rated content by using User/Pin codes. This driver has been tested on Roku (including Telstra TV and Sky Now TV variants), Amazon Fire TV, Sony FY15 Android TV’s, Plex Home Theater (OSX/Windows), Plex Media Player (OSX/Windows). If you choose to use it on any other platform you do so at your own risk. It should work however you will find the problem is launching into the application on the platform of choice. It is recommended that prior to purchasing this driver you utilise the free 48 hour trial period for testing. NOTE: Amazon Fire TV OS 5 and above currently has a bug which do not allow multiple ADB connections simulataneously. If you chose to utilize the the Fire TV with OS 5.0 and above then you cannot add in the official Control4 Amazon Fire TV driver. This is due to a single connection limitation for ADB. You can however utilize the Houselogix Amazon Fire TV driver as it will launch Plex for us. We utilise methods exposed only to the Control4 OS 2.7 Driverworks software development kit. It will not work with any lower versions of OS.